Lately, I’ve been having a lot of sleepless nights. While the major, cutting-edge trends of the last decade slowly fade into the mainstream, the future is in flux. Everyone from leading designers, to trend forecasters, to industry thought leaders and provocateurs all seem to be saying the same things—design is dead, trends are dead. Are they? As a trend forecaster and someone charged with predicting what the future holds, the question of what’s next weighs heavily. 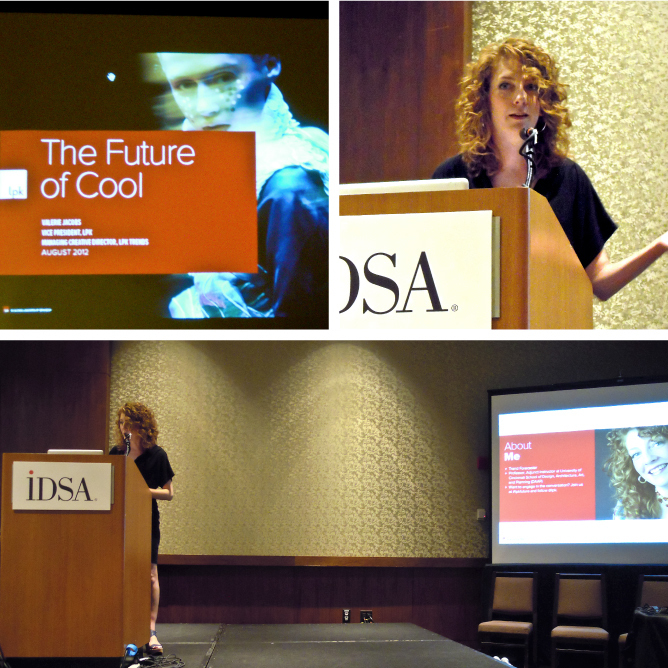 When I was asked to speak at IDSA’s 2012 International Conference, the theme of “The Future Is … ” seemed the perfect opportunity to tackle the questions at the root of my restless nights. 1. Embrace Curation. In contrast to individual broadcasting, designers must now look to a future of curation that can seamlessly blend a variety of viewpoints into a truly comprehensive experience, creating multiauthored works of art. Social image-sharing site Pinterest has enjoyed astonishing growth since its launch in January 2010. It’s now the third most popular social-sharing site and has exceeded Facebook as a platform for image sharing, according to Marketing Daily. Pinterest’s brilliance, at least in part, lies in its ability to tap into its users’ “networks of trust” (with equal or similar interests and tastes) to constantly curate content worth repinning, thereby allowing the “crap” to naturally sink to the bottom. 2. Do More, Think Less. Analyzing, theorizing and intellectualizing will only get us so far—and it’s not far enough. Designers must now embrace doing rather than thinking to unleash our creative potential (and even save our sanity). In their best-selling book Sticky Wisdom, Dave Allan, Matt Kingdon, Kris Murrin and Daz Rudkin define “realness” as one of the six practical behaviors for delivering more creativity. They describe the idea that a “word-only zone” will block creative behaviors, and they advise us to stop talking and meeting—and start doing. 3. Know When to “Un-Know” Things. Science has taught us that a complex web of the pathways in our brains molds our experiences, habits and memories. New discoveries allow us to chart these neural nuances, giving designers a leap forward into the future, leaving what’s bad in the past. The Power of Habit, by Charles Duhigg, identifies the neurological expressions behind behaviors. He explains how habits work and where they are located in our brain, and also offers guidelines for achieving personal goals and overall well-being by adjusting specific habits. 4. Embrace Tools that Illuminate Humanity. Armed with a deep knowledge of human nature, cognition and preference, new technologies now allow designers to explore, understand and connect to our human-ness in a deeper and more profound way. Researchers at MIT have programmed computers to differentiate between frustrated smiles and delighted smiles. The technology could lead to the development of intelligent computers that better access the emotional states of their users and respond accordingly. 5. Recognize Your Human-ness. As miraculous an organ as the brain is, and as substantial as our creativity and ingenuity may be, there are limits to our human cognition. New pattern-recognition technologies are augmenting designers’ intellectual pursuits and catapulting our accomplishments to new heights. The 2012 Google Science Fair grand prize went to 17-year-old Brittany Wenger, who wrote a computer program to help doctors diagnose breast cancer less invasively. Wenger’s program, which she put through an amazing 7.6 million trials to test it for accuracy, helps detect patterns in a large database of breast-tissue samples so that doctors may more successfully detect more than 99 percent of malignant tumors. So is design dead? Are trends dead? No. But maybe we’re headed into a brave new trendless world that’s filled less with strict boundaries and more with the unexpected and original than ever before. What’s your strategy for surviving the future of cool? Let’s chat, send me a message at Valerie_jacobs@lpk.com or join the conversation on Twitter @LPK.